When birth mother Mariam* learned of her unplanned pregnancy, she knew that abortion wasn’t right for her — despite the pressure she felt from her baby’s birth father to choose this path. 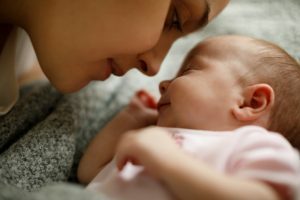 She considered parenting, but she knew that her relationship with the baby’s birth father wouldn’t last and that she would struggle to be a single parent while working full-time. Still, Mariam wasn’t sold on the idea of adoption at first — until, later on, she learned that, by choosing open adoption, she could still be an important part of her baby’s life. With her baby’s birth father out of the picture, Mariam says she was all alone during her pregnancy. To get the support she needed, she moved to L.A. to be closer to a friend. While there, she attended a barbecue — where she would meet a 10-year-old boy who would forever change her life. The little boy introduced himself to Mariam as Brent* and, almost immediately, told her that he had been adopted. Brent eagerly showed her pictures of his birth parents, and the experience caught Mariam by surprise. That chance encounter opened Mariam’s eyes to an option she hadn’t given much thought to before — placing her baby in an adoption where she could maintain a relationship with him and his adoptive family. Mariam gave birth to her son in L.A. On the night baby Milo* was born, she knew she had made the right decision not to end her pregnancy. When her son was born, Mariam realized that what she wanted more than anything was a happy life for him. She never wanted Milo to wonder why his birth father wasn’t present, and she never wanted him to feel like his father didn’t want him in the world. Instead, she wanted him to be surrounded by two parents who loved him, as well as a large extended family full of doting grandparents and other relatives — an environment she just couldn’t provide at the time. At first, trying to find an adoptive family was hard for Mariam. She decided that only when she could find the right family for Milo, she would chose adoption. In the end, it seemed like it was meant to be when Mariam found the parents she had been looking for in Elizabeth* and David*. They connected over their shared alma mater, and got to know each other over four months through frequent Skype calls. Because Milo was several months old when he was placed with Elizabeth and David, the adoptive family traveled to L.A. and spent nearly a month getting to know him and Mariam before placement. Mariam still remembers vividly the moment she had to leave Milo to Elizabeth and David at the airport. She hugged Milo strongly, her tears falling on his cheek, but she told herself that their goodbye was not forever. Despite the distance between Boston and London, where Mariam currently lives, the families have a very open adoption, complete with monthly Skype calls, weekly photo exchanges and annual visits from Mariam to the U.S.
Like most birth mothers, Mariam struggled with her emotions in the beginning after placement. For several months after the adoption, Mariam says her life revolved around work, thinking about Milo and looking at his pictures. It was during that trip, nearly two years after the adoption, that Mariam says she finally felt she was certain about her adoption decision and the transition for Milo was complete. Seeing his sunshine smile and hearing 2.5-year-old Milo communicate and express his emotions helped to reassure Mariam that Milo is growing up with his solid ground in his family. Openness has been an important part of Mariam’s story since the beginning, and now she is opening up even more in hopes that sharing her story can help her son, Milo, as well as other pregnant mothers considering adoption. She says the more people who understand open adoption in society, the fewer misconceptions women like her and children like Milo will have to face. *Names and locations have been changed.